and the winner is………………….whoever gets the cookies! Sunday, I baked cookies until I was blue in the face, and as I pulled sheet after sheet out of the oven, I felt a growing sense of accomplishment as my task neared completion. Once the baking was complete, I looked over my work, and said to myself, “Yep, another Christmas Success.” I wondered who would find a new favorite among the treats. 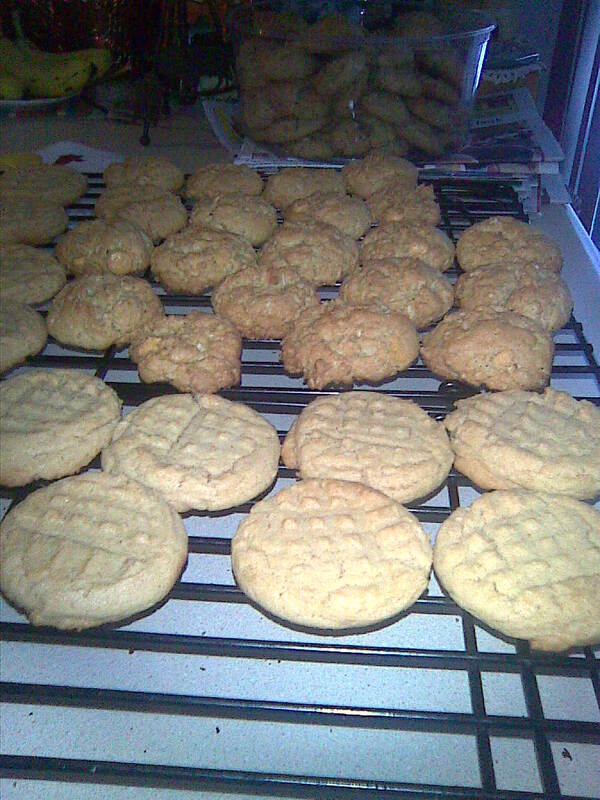 Penzey’s Peanut Butter Cookies, (only THE BEST recipe in the entire world! ), and Oatmeal Butterscotch. I packaged them all up this morning in individual Glad containers, which held about 8-10 cookies in each, and had enough for 4 boxes to go out this week, and and even had enough left over for us! WOOT! Beat the butter and sugars together until creamy. Add the eggs and vanilla, blend until smooth. In a separate bowl, mix the flour, salt and soda together with a wire whisk. Add dry ingredients gradually to the butter/sugar mixture and blend until moistened. Add peanut butter and complete mixing. Drop by small ice-cream scoops onto ungreased cookie sheet, then slightly flatten by making a criss-cross with a fork. Bake 10-13 minutes until just golden. Let stand 1 minute, then remove from pans onto cooling racks. Makes 6 dozen. 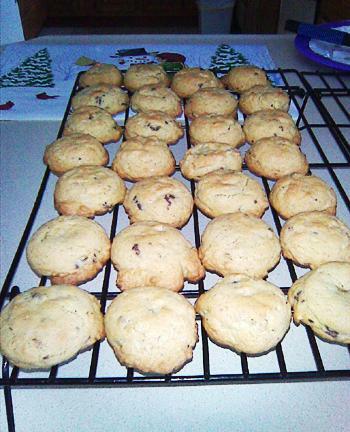 The Oatmeal Butterscotch cookies cooled hard, while the Chocolate Chip cookies stayed nice and chewy. The Peanut Butter also crisped up, but is a good thing to have when transporting via the Postal Service-they packed firmly in the Glad containers, and shouldn’t jostle around at all. Previous MyWristie-Cuffs© No. 1 completed! Next World’s Best Huevos Rancheros- It’s What’s for Dinner! Hi, just looking for a great peanut butter cookie recipe & I love Penzey’s spices, so I was happy to see this recipe posted—–just a little confused about the butter amount, though. Should it be 1/2 cup or should it be 2 sticks (which is generally 1 cup)? Anxious to try the recipe, but I want to make sure I get the ingredients right. Thank you for the heads-up and enjoy THE BEST PB cookies I’ve ever made!